http://www.vietnamvisa.pro - This is a commercial website to provide visa service online. We help you to get visa approval letter as a service. This website does not belong to Government or Immigration Department of Vietnam. If you need visa stamp on your passport prior to your departure, please go to the nearest Vietnam Embassy to request for a visa. 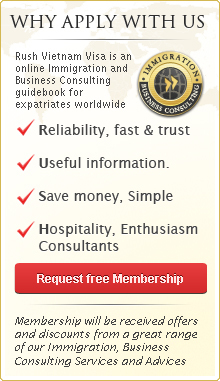 Visa On Arrival is an alternative process to get your visa approval in advance. Once apply with our assistance you shall receive an authorized letter, known as visa approval letter, issued by Vietnam Immigration Department. With a print out of such letter, you can board your flight and pick up your visa at port of arrival. In Vietnam, you can pick up your visa at international airports in Vietnam, including Hanoi, Da Nang, Cam Ranh, Phu Quoc, and Ho Chi Minh City. Applying visa online is simple, time-saving, and costs you less. Vietnam entry visa is required for all foreigners wishing to visit Vietnam except citizens of countries having visa exemption inclusion in bilateral consular agreements with Vietnam. Obtaining a Vietnam Visa is the first thing to do when you plan to visit or spend your holiday in Vietnam. We recommend that you obtain your entry visa by having a valid passport stamped prior to your departure by applying to any one of the Vietnam Embassies and/or Consulates worldwide. How to apply Vietnam business visa on arrival? Dear Sir/Madam, I am travelling to Hanoi, Vietnam on business trip and planning to stay 5 days from Jan, 28 to Feb 1st 2015. I am holding an Indian passport and would like travel by air from Singapore. Vietnam visa on arrival for US Citizen?